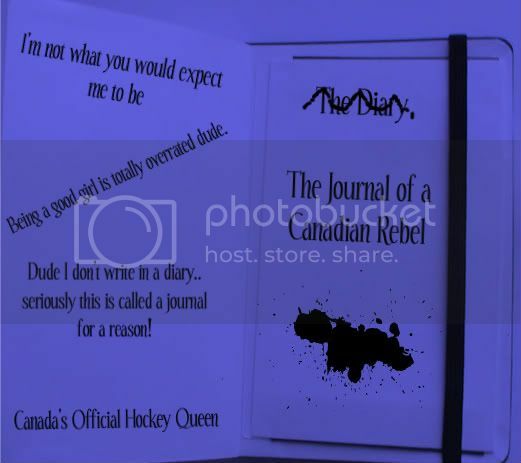 This is the journal for my character Hailey St. James, she's definitely an interesting girl and as these entries progress; the tales of her troublemaking plots will be revealed as stories of her past and possible future as the Captain of the London Knights hockey team. First off let's make this clear, this isn't a diary; only little girls write in diaries; just cause I'm 13 doesn't mean that I'm not grown up and anyone who manages to stumble upon this book should remember that. Right then dudes, for those people reading; I suppose I should introduce myself.. the name's Hailey and let's just keep it at that, my last name is classified information and unless you already know it, it means that you'll never find that out. I'm Canadian and I know what you're thinking, no I don't have an accent, yes I love hockey and I am a force to be reckoned with. If you haven't heard of me, you must not have been paying attention to what's been going on outside the Triwizard Tournament; I'm the one who was brilliant enough to not only plan but fully assemble a 6 foot tall ramp made completely of snow. It was the most awesome thing ever cause I took a running slide off it and flew right through the air; I don't need a broom to fly, just give me some snow and ice, I'll turn it into a masterpiece of crazy proportion. That's all I have to tell you for now.. the next chapter will be mentioned once I work on my next plot. Last edited by AmbiguouslyMe; 01-06-2011 at 03:38 AM. So I read this little gossip paper that apparently shows up at Hogwarts every now and again, I happened to be mentioned and whoever mentioned me should realize that I'm not a self proclaimed hockey queen; I am actually a hockey queen, haven't you people seen the crown? Anyways that's besides the point now, the point here is that I'm more awesome than a lot of these Hogwarts students. Course that's what happens when you happen to be lucky enough to be from Canada like I am. Okay so, I would like to make the point that yes I did go on a date, I was on a date with Jimmy Wilkes, he's cute but seriously she seems more like the player type and I can't risk my whole rebel rep with him being a boyfriend, he's one of my accomplices that shall help me become well known around this school. I enjoy Hailey. She's awesome like you. So reading the first entry was quick, as I'd gotten to see it ages ago. And Grayson wants to point out she helped with the ramp. And is another accomplice. My charries are out of control right now. But anyway . . . *pets Hailey and you* You're both awesome. By now everyone should realize that I'm not like everyone else, if not, seriously dude either you haven't met me or you haven't clued into the current situation. I have this total thing where either you accept me for who I am or you can just go away since it definitely is one of the most important things to actually remember. Awww did I make a few people cry? Well my bad! NOT! In more pressing matters, I've got a few blueprints that if the Prefects or Staff got their hands on them; they'd have like a field day and I'd be ruined. Well that won't happen only cause the plans are hidden well enough that no one could see them or tell they were anything else than blank paper. Oooh, blueprints . . . Someone's intrigued. So we're having this costume party and dude, you know someone like me can't just have a plain, like in the box costume; nah check this out.. I'm going as the newest superhero who still a bit of a rebel, the name is Captain Canada. Don't laugh! I'm being totally serious here, like red and white from head to toe; a hockey jersey, masquerade mask, white pants, sneakers, mitts and I'm still debating if I should wear a Canadian flag as a cape. I know I'm going to draw some attention with this outfit, that's my entire intention here. haha She so should have gone with the cape. Now we just have to round out the motley group. Why are people so nervous to meet me? I guess my secret reputation finally got around and I have to say; it's pretty damn hilarious. I think I might milk this whole situation for all it's worth, of course have to round up the ragtag heroes of Hogwarts; not now since there's not enough time left this term but of course first thing next term. Haha I'm so going to turn this school upside down next term, no one's gonna suspect that I'm the mastermind. Grayson is cracking up at the name. And says she's so in. So unfortunately this is my last entry, as you're reading this, I will be back in Canada probably lacing up my skates and heading back out onto the ice. I know this was sudden but my team needed their Captain and I decided that it was better that I headed back to Ottawa, Hogwarts; I have fond memories of thee and the year that I was there, it was pretty fun. So dudes, I gotta get back to practice; bye.